Shopping is a "hobby" that can get very expensive, very quickly - mindless shopping moreso. I'd like to believe my shopping habits are more intentional than mindless because I am very aware that a dollar saved is a dollar earned. I was recently in a consignment store to drop off some clothes that the kids and I have outgrown. After dropping off my haul, I browsed the aisle and was pleasantly surprised to stumble on a brand-new-with-tags pair of black Banana Republic pants in size 6L. Note: I used to wear size 4L pre-third child but have now accepted that my body has permanently moved into pant size 6L category. I rarely ever find long lengths in store so I'm restricted to buying pants online from sometime very limited inventory of Gap and Banana Republic Canada. Hey! 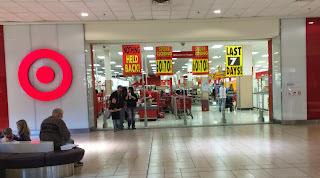 Remember when Canada had Target Stores? Reselling mine and my kids clothes in consignment stores netted me a pretty penny through the year. I sold off some of my shoes and handbags as well as my kids' outgrown clothes. Added $312 to the kitty which I kept as cash for buying replacement clothes. Kijiji is the more popular version of Craigslist here in Canada. I don't bother with Kijiji too much because it's got a higher percentage of flaky people that are not worth dealing with. Still, I occasionally sell specific name-brand items. In 2018, it was a Le Creuset dutch oven for $100. All in all, back of the napkin math tells me we saved north of $1400 by leveraging the perks and resale opportunities available to us in 2018. Special shout out to "Million Dollar Journey" blog for cluing me into the benefits of having a PC Mastercard. How about you? Any special ways you avoid paying out of pocket?